Great for LED lighting in tight spaces, or for use in conjunction with home cinema. Antonio Indirect Lighting Profile - a subtle curved shape 8cm high x 5cm projection. 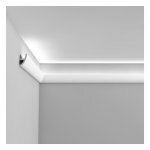 Great for LED lighting in tight spaces, or for use in conjunction with home cinema. Also available in FLEX. Please see C373F.